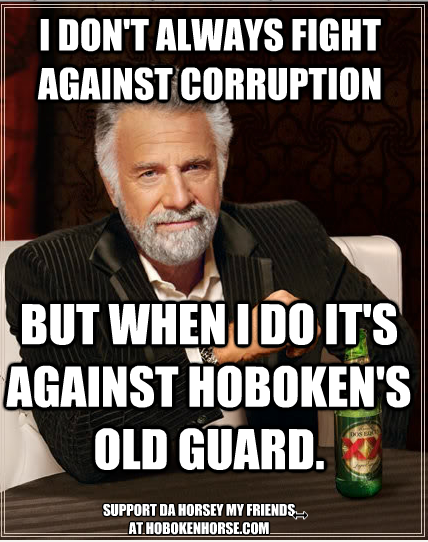 Hoboken is less than 24 hours before an election. Honestly, nothing beats a Hoboken election. The rancor, the door knocking, the flyers, the Vote by Mail. In Hoboken, it's not a serious election until someone delivers hundreds of Vote by Mail as mailing in an election ballot is so passé. In the Mile Square City, why would you waste time (and money) putting a costly postage stamp on a ballot and mail it back to the Hudson County Board of Elections when there's eager messengers who work for "community leaders," some on a full time basis to serve you better? They'll ensure your Vote by Mail ballot doesn't suffer in a drowning accident in a US Post Office or in their boss's basement. Hoboken elections; it's that caring concern for your election ballot that brings a tear to the eye every time. More to come on why the Hoboken Board of Education election matters whether you have a child being educated in the district or not; or even if you're a horse living in the greatest Mile Square City in the world straggling 21st century governance norms with our On the Waterfront "traditions." MSV will be back with key election season facts to guide you through the barrel of laughs coming your way. In this town, some call it voter fraud but others with a straight face will look you in the eye and call it "campaign work" and/or "voter suppression." They mean you no harm. Really. Just hand them your wallet. If you don't and make a big enough ruckus about all this, they'll just take it. Don't you just love Hoboken tradition?